1) We’re undergoing a small staff shuffle. Kris Fortin is leaving as our Boyle Heights/East L.A. writer to pursue other interests. You’ll still see him from time to time as he’ll be freelancing with us and continuing to work on our film series. Kris provided great coverage for us in East L.A., and we wish him well in his non-Streetsblog projects. Instead of going through rehiring process for the Boyle Heights/East Los Angeles position, we decided to promote Sahra Sulaiman to a new position of Community Editor. She’ll be writing in both East and South L.A.. Because it’s impossible to be in two places at once, there will be a team of freelancers helping her out on a regular basis. We’re excited to see how this develops, as Sahra is a unique talent…something I think you all know. 2) Speaking of videos, you might notice it’s been awhile since we posted a new video, broadcast a Live Stream, or hosted a live Google Hangout/YouTube conversation. 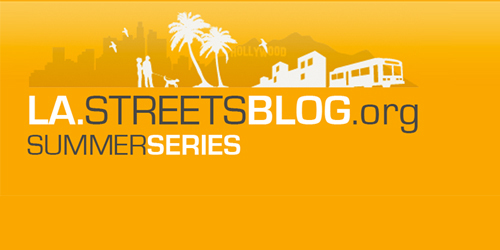 That’s going to change as I’m working with intern Matthew Tinoco on the “Streetsblog Summer Series,” a 10-part set of Google Hangout broadcasts set to begin on Monday, June 24 at noon. We’ll be discussing the incoming administration with some of Garcetti’s campaign volunteers and people that have worked with his office over the years. We’ll have more information on our lineup early next week. Earlier this year, I signed an agreement with the L.A. Times’ advertising department where they can sell ad space on our website for us for commission. The ads are short run, and provide a way for both us and the Times to make a couple hundred dollars (or more…hopefully) a month we wouldn’t otherwise. There are certain ads we asked them not to place, (car companies or dealers, AAA, Tom LaBonge*) but other than that, you could see some more mainstream advertising on Streetsblog. The easiest way to support us is to click on the ads. Of course, there will be an irony if some of the rumors on future L.A. Times ownership is true, to start getting a monthly check from Koch Industries. 4) There seems to be some question about the schedule for tomorrow night’s Bike Ride and Party to benefit Streetsblog in NELA. Here’s the schedule briefly: meet at Flying Pigeon at 6. Ride leaves at 6:30. Party at 8, or whenever we get back from the ride. Whichever is first. Get the rest of the details, here. * – Ok, the actual deal is no political ads. But it was more fun to just type Tom LaBonge. See you all tomorrow at the Flying Pigeon! CicLAvia Open Thread: It Was a Great Day for South L.A. Hide Your Wife! Hide Your Kids! Freeway Closure for the Demolition of the 6th St. Bridge is upon Us!